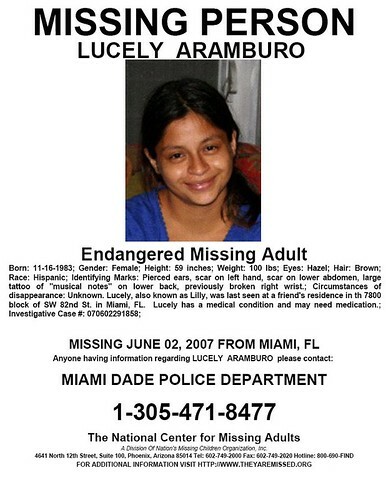 Lucely “Lilly” Aramburo vanished a dark June night in 2007. Her fiance says she went for a walk at 2am. She’s never been seen or heard from ever again. This is so common these days. People go missing. Media people ignore the fliers from detectives, rarely reporting the story to the community. Right now there’s a child abduction that no one in Miami knows about because local media won’t report it to us. It’s not “juicy” enough, as Sergeant Varela told me and Lilly’s mom. So why is it not important to members of our community? As humans and Americans we have the power to make a difference in small actions that we can do. However, most of us choose not to. Most of us are “too busy”. I ask, are you truly busy or are you distracted? I urge you, please help me find my friend, Lilly. Or help the cause of the MISSING, there are countless others. You can help us get our stories heard. 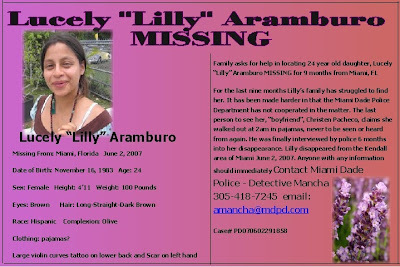 *Lilly Aramburo still MISSING* Please help today by writing letters! You can help us in this difficult effort to get her story heard. It’s been 9 months and her picture has not been seen by most folks in Miami. 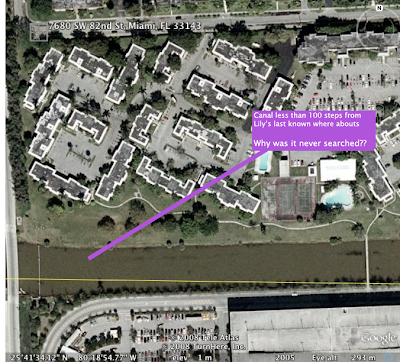 Her disappearance is not “juicy” enough, as stated by Sergeant Varela of Miami Dade Police. We need you to write to your local officials and to the local paper. Below you will find some contacts. Please write a compelling letter and send it to all of them by email. Your help is appreciated! Lilly still has not been featured on any news, locally or nationally. She needs us to speak for her. Please lend a hand today. It’s been some time since my last post but here I am getting prepared to blog again. No good news updates yet. There’s been sightings but they’re not confirmed therefore not reliable. I can only hope that someone out there sees her and calls us. The detective won’t return our calls or emails. I’m finding it so difficult to get through to them. Why can’t they treat Lilly’s case with priority? At the very least, return our calls. Please pray for Lilly and her family. In my life, I had never met someone so much like me. 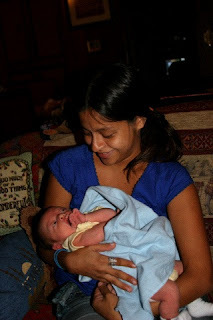 I loved spending time with Lilly. 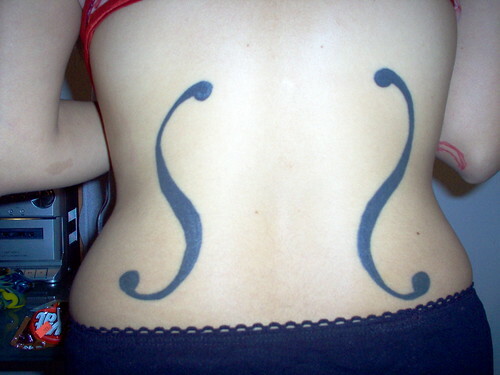 We shared a lot more than the same taste in music. Lilly loved poetry, rainy days, playing with children, art, walks on the beach, indy movies, playing with animals and being spontaneous. She was a peaceful person who was never afraid to stand up for others. I remember her as a free spirit, very easy-going, kind-hearted, and fun to be around. She was compassionate, humble and the furthest thing from materialistic and superficial. As a kid, Lilly enjoyed acting. She was a regular on a popular Spanish TV show, Sabado Gigante. She was very artistic and always kept a journal. Lilly loved animals, above all dogs were her absolute favorite. It wasn’t unusual to see her offering food/water and affection to homeless animals or seeing her give away her last dollar to a homeless person on the street. She practiced Buddhism and meditation, even living at a temple at one point. Her Buddhist name is Karma Drolkar. She will always remain that free spirit little pixie in my mind. 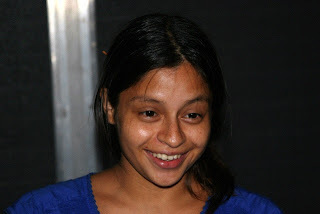 Lilly shared many stories with me about her life and her adolescence. She told me about her childhood, and the times she ran away as a teenager. She would leave her mother’s house to stay with her best friend. But always kept in touch. She suffered from depression and emotional problems at a young age, her best friends meant the world to her. Until she met the love of her life, her son’s father. Here are my pictures of Lilly. Such a beautiful girl, inside and out. A kind, gentle person, someone I will never forget. Please say a prayer for her tonight. Pray for justice to be served and all missing loved ones to be found. It’s so hard to believe she’s gone and it’s been such a long time since anyone has seen her. I worry so much about her, she’s constantly on my mind. If only law enforcement could feel a tinge of that concern, they would do everything in their power to find her. And justice would be served for Lilly Aramburo, my sweet pixie friend.